For the rice, in a heavy bottomed pot, heat up the butter and oil and roast the rice for a minute or until a nutty fragrance permeates through. At this point, add the garlic and saute until the garlic turns slightly translucent. Careful to not burn the garlic. Add the white in and stir. 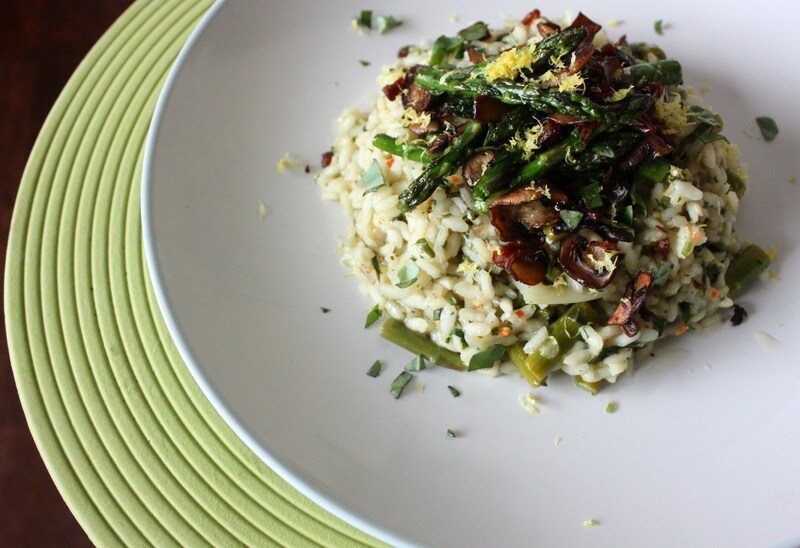 You will be doing a lot of stirring – after all that is what making risotto is about. And when you see that the liquid from the wine is quickly reducing, add the vegetable broth in 1 ladle at a time – to which you have to stir so that the bottom does not get burnt. After about 20 minutes, the liquid from the vegetable broth will start to turn creamy but each grain of rice is still while with a slightly opaque center. Taste it – is the center of the rice too hard? Cook for another 2 minutes and taste again. The rice must be creamy on the outside and al dente on the side like a perfectly cooked pasta. 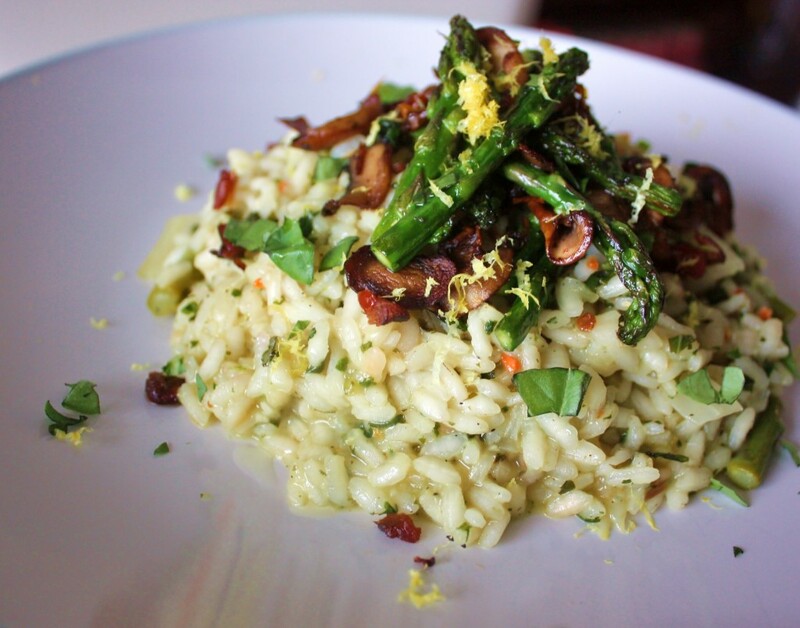 Once that is attained, your risotto is good to serve. Toss in the chopped basil at this point. For the roasted mushroom and asparagus, heat up a wide pan with olive oil and butter. When the butter is completely melted, add the garlic and mushrooms in and saute until they are brown around the edges. It is important to not crowd your pan with too much mushrooms or it will never brown. Nothing is worse than boiled mushrooms – at which point any kind of mushroom will surely be ruined. Boiled mushroom tastes and smells like rotting wood; it is not good eating, for sure. Once your mushrooms are browned, add the asparagus in and saute for a minute or two. At this point, you want to drizzle your balsamic vinegar around the pan so that they will trickle down the pan that way. The reason why I drizzle the vinegar around the pan like this is because it allows the acidity to cook off as it travels to the center of the pan leaving a lovely trail of sweetness that balsamic vinegar is known for. Add the lemon rind, salt and pepper to taste and cook the asparagus until they turn a nice bright green and at this point, it’s ready to be used over the risotto. I’ve been waiting patiently till you update again. I love your blog and the beautiful pictures in it, I believe I have re-read almost all the previous posts in your old blog during your hiatus. Can’t wait to see more new recipes. Lady G: Thank you for the sweet words! I want to update more often but have been busy and to top it off, my camera lens is broken. Once that’s fixed, I’ll update more frequently. In the mean time, stay tuned!